Will it be a GODZILLA El Nino? Every year there are lot’s of forecasts for the upcoming winter. As a ski shop owner I tend to want to scan all the various predictions until I find the ones I like. Every year SOMEBODY thinks it will be a good snow year. Sometimes it is the National Weather Service, other times it is the Farmers Almanac. Some years it could even just be Tim from Alameda who has a hunch it will snow a lot. This year tall the forecasts seem to be similar- “HUGE EL NINO!” they are shouting. One newscaster last week even called it a “Godzilla” El Nino. I wasn’t sure how a huge Japanese monster had anything to do with yearly precipitation, but I am thinking Godzilla might be fun to ski with? Anyway, it is hard to argue with the science behind it as I simply do not do my own ocean temperature monitoring. I just have to trust people that do it for a living. It is looking right now that it could be one of the strongest El Nino’s since 1950. That could be very very good news for us powder starved skiers here in the sunshine state! We were talking today about how much we have used our race skis the last few years as we mainly had firm snow to ski on. It would be nice to spend more time on the fat skis this year! Whatever happens we will be here to help you have a great ski season. Boxes of goods are arriving every day. We open them, geek out at how cool it all is, and put it away for you to check out when you come in. We are currently getting ready for our big Fall Sale which starts on the 29th of August and runs through September 13. All the gear left from last year is at closeout “just get rid of it!” prices, and the 2015/16 stuff is on sale too with all of it’s shiny newness! Come on down and check it out. Gear up for a Godzilla year! We should be having fun now! We should be having fun right about now up in the Sierra. But we aren’t unless we are up high or at a few select resorts. Many of the Sierra resorts have closed and a few more probably should. Carson Pass is said to have a few pockets of good snow but not much is good in the back country either it seems. Mt. Rose is way up high and still skiing well this spring. Mt. Batchelor has had it’s own weather system all year and is holding snow well into the spring. 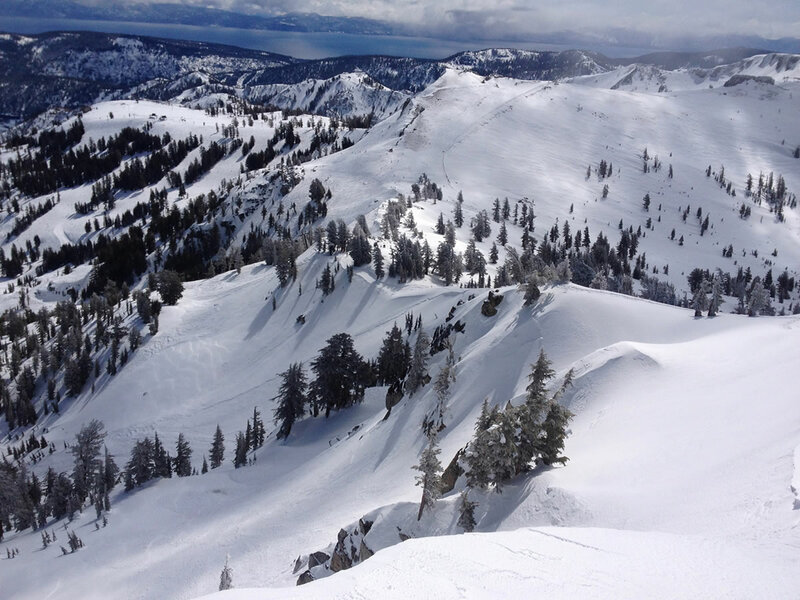 Alta has considerably more snow than any of the other Salt Lake resorts and is good to go for spring skiing. Brians Head in Southern Utah is having a better than average year. When on the phone to Fischer skis back in New Hampshire I actually heard “I am so sick of winter! It’s snowing again today!” To which I replied that I was going to golf tomorrow. I’m not really going to golf but I knew that would make him jealous. It was all I had in response to the snowpack in New England. So it is not dry everywhere at least. So will you find the time and make one last trip? We are having what may be the biggest markdown sale in the history of the business and we only had a few sales today. We spent all day ordering shop supplies for summer maintenance and to be ready for next year. Which we better start preparing for now because the forecasts are coming in! ECMWF: December looks wet, and we all will certainly be crossing our fingers that this verifies. California is in the midst of a truly devastating and historic drought. January and February looks warm. February could be wetter than average for northern California. Farmers Almanac: a warmer than average winter, although not by too much. January is slightly on the wet side. Fingers crossed! I may try to ski one more time. Then I golf, cycle, fish, etc. If you are not busy and want to save some serious money come on by before April 12th. All skis are 40-60% off. Everything else is cheap too. We would be happy to see you! We have been selling a lot of bags lately. It seems that the customers are willing to travel to find good snow. And traveling to Tahoe has not gotten the job done lately. So our customers are flying all over. Employees too. John just spent 5 days at Jackson Hole and Erik was at Copper Mountain in Colorado this week. Basically people want to follow the snow. So how much would it cost to go out of state to ski? Where is the snow? Utah has some good snow, and I have gone there enough to know it is pretty cheap and easy. of the last 5 years in Ski Magazine. Plus Utah has had better snow this year. they say “greatest snow on earth”! good day because I have that day off and I looked it up. the resort of your choice. it is a three hour drive covering 183 miles each way. And you leave and arrive home at about the same time depending upon where you live. So a second day is not too much more either! about… and if you have other travel tips or ideas let us know so we can pass them on! Jackson has such nice legs! This last week has been eventful. We were very busy at the shop over the weekend. We have four new hires running around looking confused but interested. 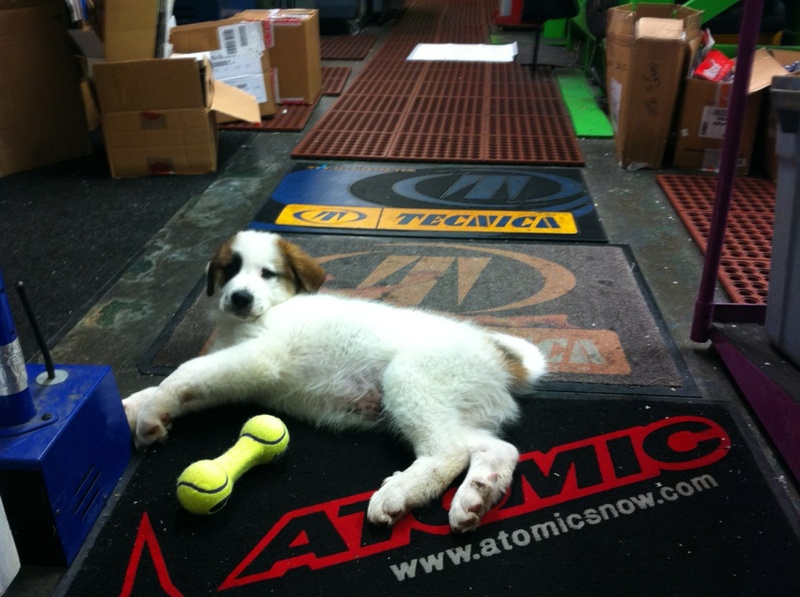 We have had multiple product clinics including Dynafit, Fischer, Stockli, Toko…the list goes on. Then on Monday the shop sent a crew up to Masterfit University boot training in Reno. We do boot training on a regular basis through a variety of different groups that have things they can teach us. This is the one that is the biggest (and the closest) however and I always enjoy it. So this year I went along for the two day class as well. Three of us were in the “Dark Arts” group which is the most experienced group of fitters. It is always so great to be able to get deep into boot fitting with people that have so much experience. Greg Hoffman, Jack Rafferty, and Jim Schaffner were the instructors for this years session. All three are legends in the world of ski boot fitters and are all very good instructors to boot! Jackson Hogan’s stance is being scrutinized by Greg Hoffman. I think Greg is saying “nice superior extensor retinaculum!” I love this place! Also in the Dark Arts group were Corty Lawrence, Jackson Hogan, a Canadian or two, some folks from Viking Ski in Chicago (always good boot folks over the years) and a number of other people that I really enjoyed spending time with. It is just not that often that we get to spend time with our peers like this. Most of the time we are working hard to keep your feet happy in our own little world without too much of a chance to come up for air. I always feel very lucky that I get to work with a group of bootfitters as talented as the ones here at the shop. We have gotten to know each other as fitters so well over time, however, that we love to get out and freshen it up with some other boot geeks! It is also great to be able to talk business with people that I respect very much in the industry. While we are on one level “competitors”, we are also all in this together and only wish the best for each other. Also interesting is getting to chat with the many ski shop folks taking the more basic classes from shops all over the place. Sports Basement had some folks there. SSV employees from Any Mountain and Northstar were well represented too. Everyone seemed to be learning a lot, having a great time, and very passionate about selling boots. There is also a great social vibe and we spent a dinner downtown with Phil Pugliese (Start Haus)and his wife Trish (www.OnTheSnow.com). Trish also works at True North at Northstar and her co-worker came along too. Lots of Chinese food was consumed and a good time was had by all. I went back and turned in early but a few of the younger (or at least feeling younger) boys and girls came back and headed right for the casino floor. So now it is back to the shop to compare notes from the different classes and breakout sessions. And we will start full time hours this week too. Boreal opened today. It is all happening. I love it. Winter is coming! I think I may “vacuum” my boots more than I vacuum at home! A few years ago, I was lucky enough to be one of the first “civilians” to get a pair of Fischer Vacuum boots made for me. I flew to Salt Lake City and the Fischer Race support guru molded my boots. He had been fitting the revolutionarry new boots to all the Fisacher World Cup race athletes and was excited to fit his first potential dealer. The process started by heating some boot shells in an oven. Then he put my foot into the liner and laced it up with shoe laces. When the plastic boot was heated up enough, he put my foot in it and put some big bags around the boots. I was placed on a machine that held me in one place. Then the bags were pumped up to a high pressure which pushed the boot against my foot and leg. When the process was over my boots were “molded” to my foot shape! I skied them the next day and was sold on the concept. I knew after 30 yards that they were the best boots I had ever skied. That winter we partnered with Fischer as one of a dozen or so shops in the country to carry the new boot the following season. Our initial order was for about 60 pairs. I skied the boot that spring and was overwhelmed with the great fit and performance. Before the shipment date we upped the order to over 250 pairs! Since then we have made the vacuum process a big part of our program. The vacuum boots have become our best selling models. They also have the lowest percentage of “comebacks” for modifications. This is great for the customers. Everybody prefers to get a pair of boots and just ski them happily from the very first day. As we have worked with the boots I have been the guinea pig for a variety of upgrades and experimental processes. First I worked with a liner company to develop a warmer liner as the initial models were a bit on the cold side. I remolded my shells a few times to help sort that out. Then I molded them to my Intuition brand liners from my old boots to compare the fit to the newly developed warmer liners. After that I worked with a company that makes a “foam injection” liner and they molded my shells with the injected liners (in Salt Lake City again). That was a wild one- Vacuum bags getting pumped up to pressure while the foam was injected into the liner at the same time! After skiing that liner for the best part of last year I got Fischer to send me a pair of their 2014/15 liners and I remolded the shells again. My plan was to ski this excellent liner for the 14/15 season. Now we have obtained a new piece of hardware available from Fischer to help mold the boots even more effectively and quickly. We can now control the fit of the front half of the boot separately from the back half. Guess who got to be the crash test dummy on the new device? Right – ME! But it is all in good fun, and I need to learn with my staff. Somebody has to to get up there on the machine and give input. So at this point I can probably say I have more experience from the “consumer” side of the process than about anyone. I have had numerous liners and have molded them at a wide variety of pressures and stances. If I do the process just as we have developed our shop protocols, they come out spectacular every time. I simply love these boots! And for anyone that thinks the vacuum boots don’t mold and change A LOT to each customer as needed, check out the photo above. The left boot is mine and the right boot is a stock boot of the same size and model. Apparently I pronate quite a bit and I also seem to have chubby heels…but you know that your feet always look heavier in photos right? Martin is getting ready. He has his party hat on. 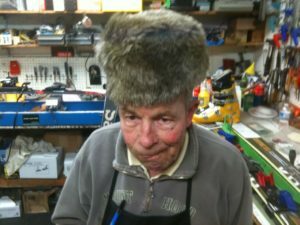 We are all busy as beavers getting the store ready for the ski season. We have made lots of changes and getting things dialed. Staff training season is here too so the company representatives are coming in to do their educational training. and on top of that the customer traffic flow has been higher than ever before during the early season. It feels like go time. But it is not- it is “get ready for go time“. Go time is another level altogether! But for now this is exciting and keeps us very busy. -Filmed a segment for Kevin Tinto of Slidingonthecheap.com on what is new in boots, plus a segment on skis and one on gloves. It will be Go Time! Ho hum. Not too much going on right now. A few items trickling in from Fed Ex and UPS, but most of the early shipments have arrived. There is very little pressing business from a customer traffic standpoint and it is sort of a “dog days” of fall here at the shop. Everyone is pretty relaxed. -Receive the rest of the big orders ( Where are you Lange Boots?). -Make the store look like a retail operation instead of a Barn full of boxed goods. Including a complete new store merchandising round with all new tags for the 2012/13 season. Well this is Radford. He’s about 10 weeks old. Radford jumped right on these skis as soon as I tossed them on the floor. 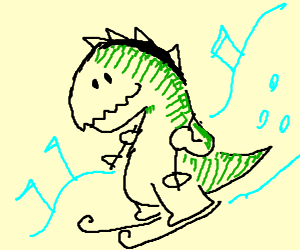 He is ready to ski! He has never seen snow, but he seems to know that he will like it. Seeing as he is a Great Pyranees mix, I think he is on target. With his double coat and his double dew claws attached to big webbed feet, I am guessing he will be a great “powder hound”. Actually, it is my hope that he will get to go out and do some back country skiing with me by spring. He should be old enough to give it a go this winter I think? In the meantime he will probably be at the shop if you come by. Also at the shop will be some new toys for the upcoming season. We have been getting shipments in on a daily basis. Dalbello boots were first and then came Black Diamond which was exciting. Our first big shipment of back country gear! I spent a lot of time playing with the packs, checking out the shovels and probes, and trying on boots that were sooo light! I’m very excited about all this new back country stuff. But let’s not forget about resort skiing! We will be back with a strong line of Blizzard skis, the Head skis are amazing this year, Fischer Vacuum boots are expanded with new models, and we will have Lange on board too which is exciting. So there is lot’s to get excited about! To get things rolling we kick off the season on the 25th of this month with the start of our Fall Tent Sale. The sale will run three consecutive weekends through September 9th. We rely on the sale to clear out last years stock and to give us some cash to operate and do staff training before the snow hits. It will be interesting to see how things go this year. On the one hand I feel there may be a bit less interest this fall because of the less than snowy winter last year. Lot’s of people skied less than they typically do, and so there may be less carry over ski excitement than there had been the last few years. On the flip side is that we had a lot of carry over gear due to the moderate snowfall so we have marked things down more aggressively than ever before to try to move it all out. And it will be interesting to see how much people poke around at the back country stuff. I have no idea what to expect on that one. We will have Seth Green and Rich Meyer around who are both ex Marmot employees and have serious knowledge to help you learn about (and hopefully purchase) new back country, touring, or side country gear. If it is slower than hoped for they wi;ll be trining the staff and passing on their knowledge. Hopefully Seth and I can reach an agreement to have him working here all winter. He is a sharp and fun guy to have around. And he will add some real expertise to the new catagories we are stocking. Rich is a professional guide that we have reccomended for some years now. As usual, Rich will be doing avalanche safety classes as well as guidingto help you be safe out there (http://www.richmeyeralpineguide.com/). So another summer has come and gone. The kickoff sale is upon us. Then the hiring/training season after that. Then it will snow. I hope the fall goes by as quickly as the summer did. I’m ready to ski! Hope to see you all next weekend. We can all catch up a bit, and start getting our stoke on. I’m ready! Radford is ready! Are you ready? I COULD do a whole blog about how great my staff is. That would make about 10 people really happy around here at least. But it might not be the most interesting thing for you other readers, so I will pass on that. I COULD write about my experience at the recent national trade show in Denver. That is always interesting, but I do that most years. If you want to read about that just go into the archives and look at entries from late January or early February. Let’s just say that there is a bunch of very cool new stuff for next year! I COULD write about how we are currently throwing a massive store wide SALE unlike any we have ever had this time of year. All skis are 30-50% off. Clothing is all at least 30% off. Helmets, gloves, goggles and the like are all 20% off etc. But this blog is not about store promotion (although it just crept in right there!). I COULD write about how we are now on Facebook and even have a twitter account. How I have wanted to do this for a while and finally it is happening due to my great and creative staff. How they have been doing interesting and creative entries and videos to post. How you should all check it out. But instead of all that let’s talk a bit about backcountry skiing. Yes, I said backcountry skiing. What does that actually mean you may be asking? Backcountry skiing basically refers to two things in my mind. One aspect is simply alternative bindings to conventional alpine set-ups that allow one to also go uphill on skis instead of just going down. The second aspect is the “backcountry” part meaning no lift tickets, no crowds, and a more pure mountain experience. Backcountry ski shops typically cater to what we might categorize as cross country, telemark, and randonee skiing. If you don’t know what that stuff means look it up. Or just type in “backcountry skiing” into your search engine and explore. If you are familiar with these terms then you may know that for the last 15 years or so the backcountry skiing has been the stronghold of Marmot Mountain Works here in Berkeley. They have been specializing in this aspect of our sport as well as climbing and camping gear and doing a good job of it. 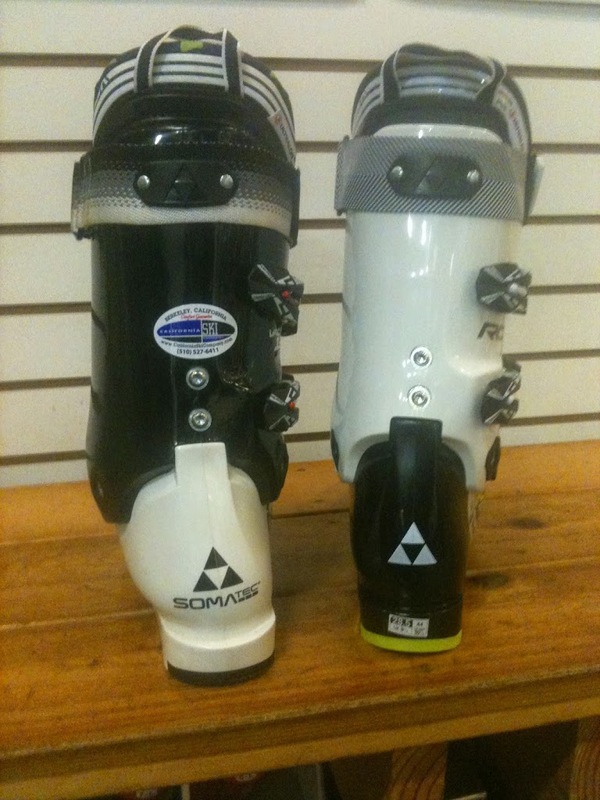 We have done lot’s of binding mounts and worked on lot’s of boots meant for this aspect of skiing that were sold by Marmot over the years. CalSkiCo and Marmot have had a great symbiotic relationship. Many are the times that customers have asked if we were going to start doing backcountry gear. My stock answer has always been that it is a small niche market and that Marmot was representing it well already. If we competed with them there would then be two entities right in the same town serving the entire bay area for this niche market and it was better to allow Marmot to take all the business and do it right. Well Marmot is closing down this month. They have a second store in Washington state and the owner has decided to close the Berkeley location. It is a sad thing for many who enjoy this aspect of the sport. Marmot has taken care of the needs of thousands of enthusiasts over the years. Now the closest real backcountry shop for them is ‘The Backcountry Store” in Truckee. Sunrise in Livermore has some stuff. Gary down at Helm in San Mateo dabbles a bit with a boot line to compliment his alpine boots. But as far as I know that’s it. And someone has to take up the slack. Should it be California Ski Company? I have thought about this a lot over the last decade. We have always been a true specialty shop. No snowboards. No summer business model. Just alpine skiing. Sticking to our core competency. But as time has gone on, the line between alpine and backcountry has become blurred a bit. Mainstream alpine companies are now getting involved with backcountry, and it has crept into our store all on its own. Marker Duke bindings came out as a crossover alternative to established randonee bindings and are hanging on our wall. Fischer Watea skis are so light that they are desirable as backcountry skis and we have sold many pairs for this use. They are even notched for mounting climbing skins from the factory like true backcountry specific skis are. We have sold Stockli “touring” skis as alpine models because they worked well for that purpose. We even stocked the Dalbello Virus backcountry boot for a season. The shop mounts enough backcountry bindings that we have mounting jigs for the more popular brands. We are very familiar with the whole world of backcountry. Now both Salomon and Tyrolia have new backcountry bindings that will be marketed under the brand names of Salomon, Atomic, Head, Fischer, and Elan. And all of those brands have plans to continue to develop this aspect of their offering. The truth is that while backcountry still only represents about 2% of the industry sales, it is the fastest growing market segment for the last number of years. It has grown to the point that the “Big Boys” have taken notice. They have decided to compete against the small backcountry specialty brands. Now they will advertise it and drive the backcountry scene even more. You will see more and more articles in Ski, Skiing, and Powder magazines. Mens journal and Outdoor magazine will do backcountry gear expose’s. What do you think? I think that if we don’t do it somebody else will. Actually I know that is the case. If not this year then soon. I think that we are already spatially challenged but have always found a way to cram more into this funky cool retail space. I think that this is NOT the year to make a big move from a financial standpoint due to a down sales year. But I think now is the time to strike if I have the desire and the nerve to take a bit of a gamble on next years weather. No risk, no reward, right? And as they say “There’s no such thing as a free (heel) lunch”. And pray for snow. “Thinking snow” doesn’t seem to be getting it done this year! Well now it is official. We are in “snow drought” conditions. As snow farmers we simply need snow to make money on our products. And we have not had any snow. And it doesn’t look promising for this week either. Crap. So now what? Well, we keep waiting. And hoping. And praying. But at this point one must make some adjustments to the game plan too. We are down 28% for December as of Christmas eve. That means about $70,000 less money coming in for the month. Being down in an early or late season month is bad. Being down in December really hurts as it is the biggest sales month of the year for us. We are lucky to have had a strong year leading up to December and were up 30% going into the month. Now we are up only 8% for the season to date. Our big fall numbers have been off-set for the most part, and the rest of our cushion will be gone soon too, as January is our second biggest month. So I forced to deal with some cause and effects right now. We have staffed up big time due to our strong early sales. With good snowfall we expected to be UP quite a bit for December so I set staff levels to handle it. I have not cut back on hours yet as my staff depends on paychecks that were promised to them. So I have absorbed the hit myself so far. I have tried to keep them busy but there is only so much work to do. Mostly we need customers to come in and generate the need for work to be done. Tuning, restocking, selling etc. don’t happen without customer flow. But now I will have to cut hours until it snows. Same sales plus higher payroll is not good business. I hate that and the other employees hate it more! Also to be considered is sell through. That is to say that we have stock that needs to be sold. If it is not sold in a timely manner it devalues (can you say close outs?). Not just here in these walls but all over there are shops that will be worrying about selling through their inventories of skis, boots, clothing, and, well, everything. So many of them will start to discount earlier than they normally would. Human nature plus nervous owners plus bills to be paid will make certain this happens in some stores. Which makes everyone’s stock worth a bit less. It is a vicious phenomenon that must be managed properly form store to store across the land. The good news is that I am still sane and happy to be going in every day. Some of the sales reps have told me that they dread calling on certain accounts as the owners are either very depressed or very cranky. I just don’t see the use in that. The weather is beyond our ability to control, so what good does it do to freak out or mope? But the fact is that some shops may not make it through the winter in a year like this. If you are not financially sound, a lack of snow can sink your ship. And it would indeed be depressing to think you were in that situation. That’s why I try to keep some nuts stored up from the previous year to rely on if need be. So I think we will be ok, but I may have to stick with my Kirkland brand jeans for another year. And that’s ok.
More important is that fact that the skiing is not great right now. Not great for me. Not great for you either. My daughter Rebecca bought a Squaw/Alpine pass this year and is on Winter Break from school. She is really bumming! She may change her New Years eve plans from Tahoe to San Diego! I think I convinced her that man made snow is still better than sand, but still she is not a happy camper. And all those Christmas ski vacations our customers planned that are less fun or cancelled? Not a happy thing. So I just try to keep in mind that it WILL snow. And it will probably snow a lot. It is just going to be a few weeks later than we had hoped this year. Most people quit skiing well before the resorts close. If you feel like you need to get in a specific number of days to pay off that pass or make your ski lease worthwhile, just know that there will still be plenty of skiing available. Don’t give up on old man winter- he’s just a bit late to the party! And it is not like there is no skiing you know. It has been cold and the resorts have been making snow like crazy. I have only had one day on the slopes (I know, I know- I will catch up!) but it was great and I owe that to man made snow. And if I can only get my Eskimo to stop looking at the weather every day and freaking out about all this, I should be able to hold it together on my end. You do the same out there too- ok? Just make sure you are ready when it happens. Because it will happen. And it will be great. In the meantime thank goodness for snow making machines!